It takes regular vegetables and turns them into cute little noodles!! And it's a perfect way to get more veggies in your diet. My Creamy Red Pepper Alfredo over Zoodles (a fancy way to say zucchini noodles) was my #1 post last year! People LOVE them!! 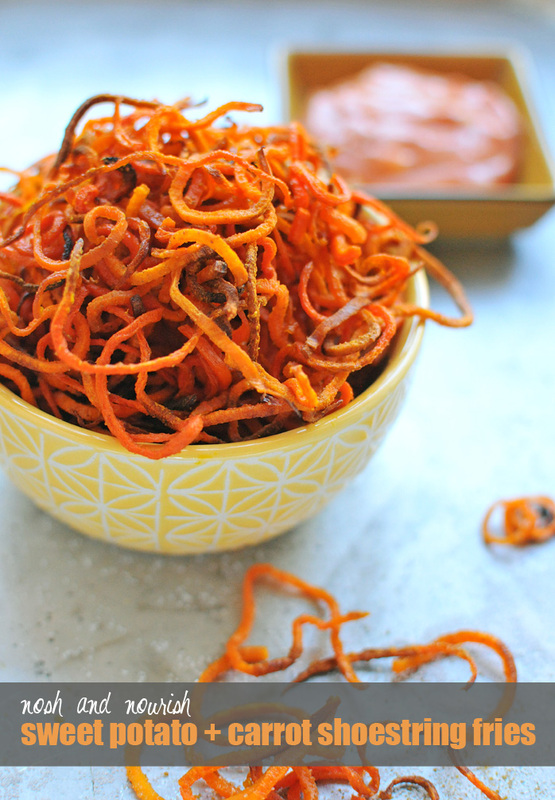 So when I saw Davida at The Healthy Maven spiralize potatoes (get the recipe), I knew I had to try it with my sweet potato and carrot fry recipe. And, OMG, I'm so glad I did! These were devoured in about 2 seconds flat by Dear Hubby and Babycakes. Who knew feeding them vegetables could be so easy?! 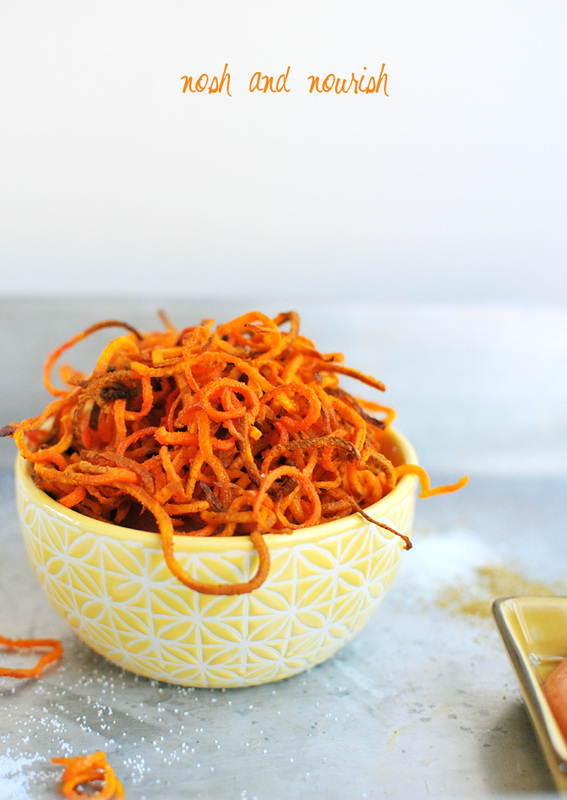 These sweet potato and carrot fries are the perfect side dish for these buffalo ranch veggie burgers, a regular burger, these sloppy joes, or seriously... just as a stand-alone afternoon snack! So, no more lollygagging... it's time to go get a spiralizer and start making veggie noodles!! 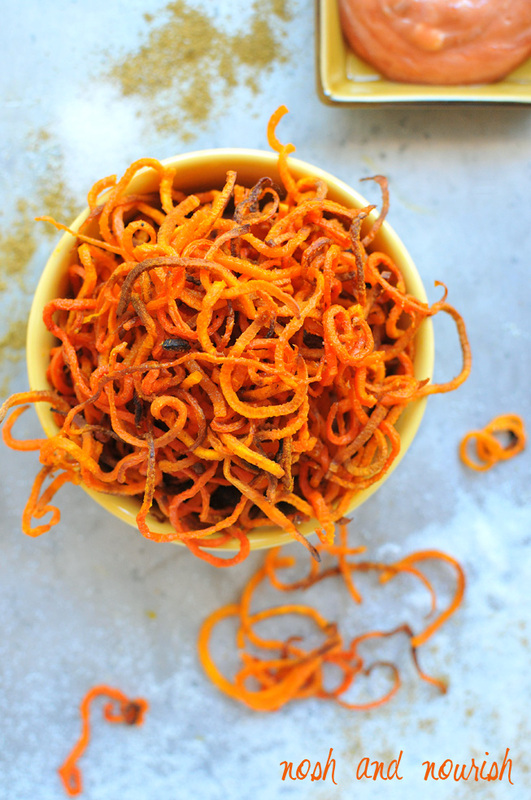 Spiralize (or julienne) the sweet potato and carrots. Combine the salt, cumin, and cornstarch in a small bowl. In a large mixing bowl, pour the olive oil over the spiralized vegetables. Stir to coat evenly. Lay the veggies as flat as possible on a large baking sheet. Squeeze lime juice evenly over the top. Bake for 25 - 30 minutes, flipping halfway through, and watching to make sure they don't get too crispy. During the last 5 minutes, I removed the crispiest ones onto a plate, and used tongs to move around the fries so that each could have a turn near the edges. Combine the ketchup and Greek yogurt to make a creamy dip for the fries!